Come kayak this remarkably beautiful estuary, which retains substantial tidal marshes on Lazarus Island northeast of our launch site and west of Dean Point. 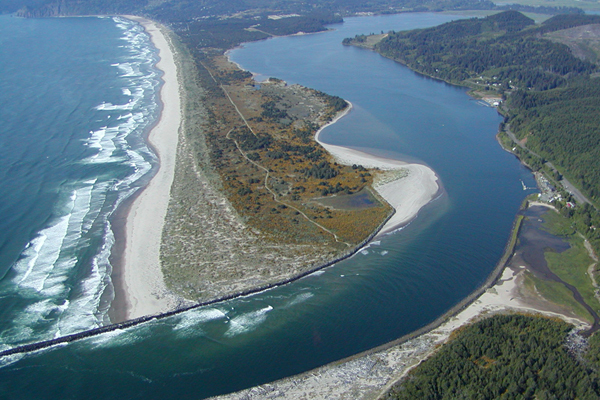 Nehalem Bay State Park boarders most of the northern shoreline, offering a untouched and natural presentation of the surrounding wildlife areas. From your kayak you are likely to see anything from Eagles to Elk, as well as evidence of shrimp, clams, and oysters. A diversity of other life like white sturgeon, American shad, striped bass, and Pacific lamprey also inhabit the area. This waterway is part of the Pacific Flyway, one of four major migratory routes in North America, and its natural habitat is an outstanding area for birdwatching while paddling. California Brown Pelicans return in the summer, while winter presents large groups of waterfowl like as buffleheads and widgeons.